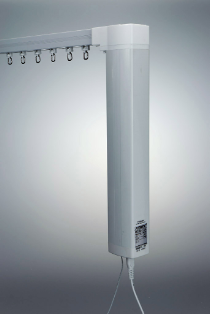 The MD360 Motorised Curtain Track System is a long established solution to Sun Protection applications. It has gathered a lot of pace over the last 5 years since its introduction into the UK market. Whilst giving the benefit of a cost effective solution to Electric Curtain Track applications it does not compromise on quality or functionality. With the easy to use timer control you can set the curtains to open and close automatically should you be on holiday, at work or to just block out harmful sunlight that can damage your furnishings. The timer function also acts as a security feature by simulating occupancy of the property. 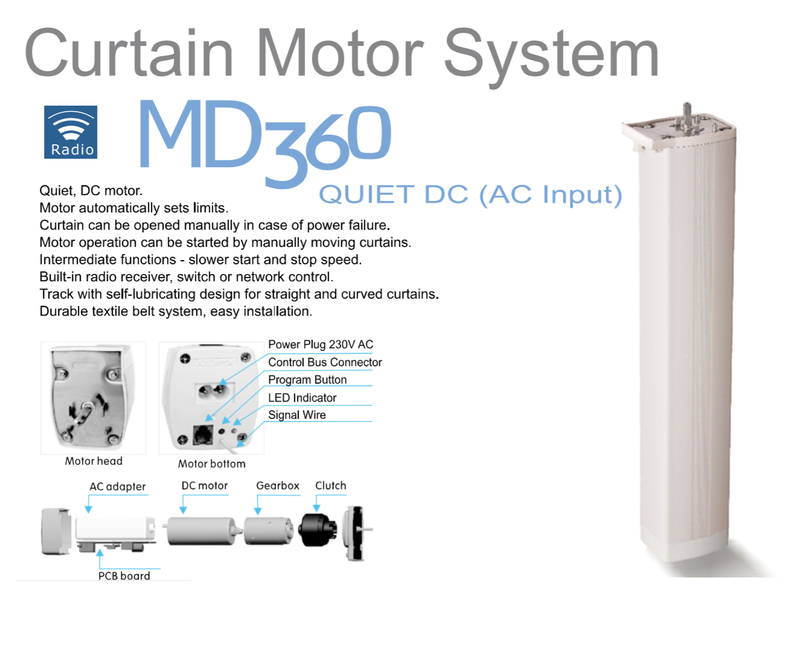 As well as radio control the MD360 comes with Touch Control technology, gently pull on the curtain to either open or close them automatically and in case of a power cut the integrated control means you can still operate the curtains as if a manual system. The motor is hidden behind the curtain, making it completely unnoticeable. The MD360 can simply plug in to a mains socket in which case the track can be installed without the need of an Electrician. 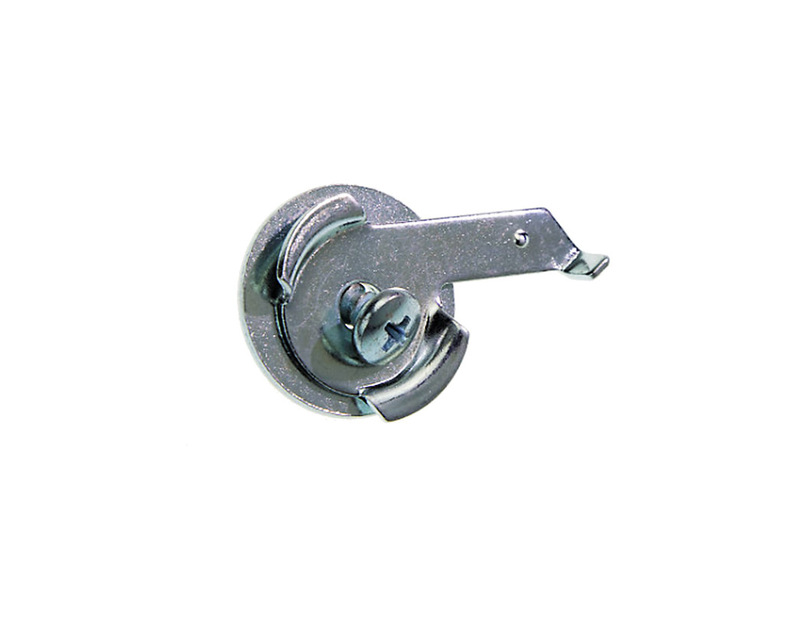 All you need to do is fix the track into position using the brackets supplied, hang the curtains and plug it in, what could be easier. 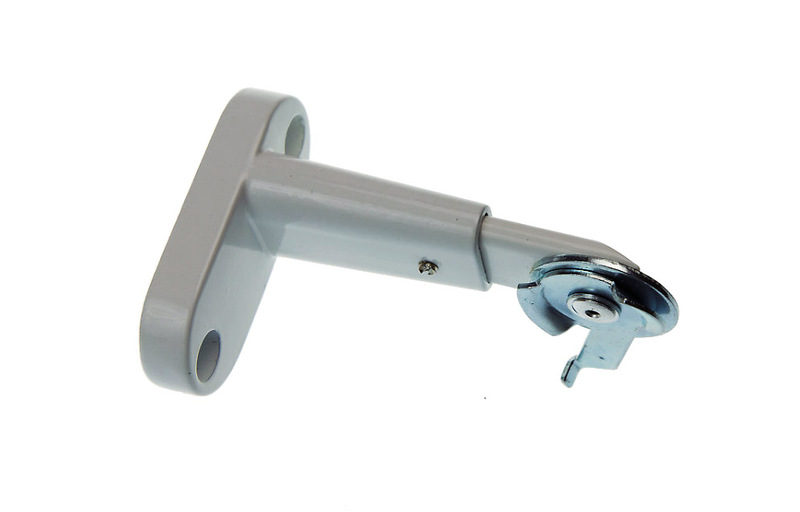 The Radio Controlled Electric Curtain track system has an built in Dry Contact socket (DCT) at the base of the motor which can facilitate most Home Automation or building Management Systems, giving it that little bit more versatility either for the future or right now. There is a whole range of remote control options from Hand held remote to wall mounted with Timer control options. All our Electric Curtain Track range can also be set up to work with Smart Phones, Ipad and Laptop’s by incorporating an inexpensive device currently on the market. The possibilities to control the Electric Curtains are virtually endless, you can even simulate occupancy of the property by pre-setting the Curtain system to open and close. If you prefer the traditionalist approach we have built in an integrated Touch Control function through the sophisticated software, which basically means if you give the Curtains a little Tug the intelligent motor will pick up the movement and direction and engage the system to fully open or fully close depending in the direction of the Tug. Every Curtain Track is Custom made to your specific requirements and specification, whether it be for a continuous curve, 7-sided bay or simply a straight track we have it covered. All shaped Tracks are drawn up and emailed to you for approval before production so you can have peace of mind that everything is in order before it arrives.